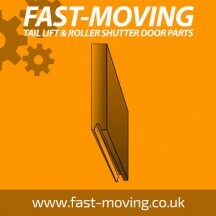 Dry freight roller shutter door replacement wooden panels. Marine grade multi-ply panels. Pre-primed. There are many manufaturers of dry freight roll up doors on the market. We can offer you advice on suitable replacement to suit these dry freight roll up shutter doors that will give you a quality product at a super competitive price. All wooden door panels to suit dry freight roller shutter doors are manufactured by All-ind Limited are are the very highest standards in quality at an affordable price.